'The Cuckoo's Nest' is one of only four dwellings at the end of a quarter mile woodland track, fully self-contained and very well-equipped, with 30 acres of private woodland paths to explore and only a mile from the nearest village store and pub at Mawgan. The Cuckoo's Nest is also only a mile from the creek-side village of Gweek with the famous Seal Sanctuary, The Black Swan, post office and Spar general stores. The tree lined road from Gweek follows the tidal creek along the wooded valley with a turning off through a shallow ford, and along the private track. Visitors have use of the woodlands. (There are footpaths around the woodland). Entered via French doors to the Lounge/Diner, very comfortably furnished with three seater settee and easy chair, free-standing electric fire (looks like a wood burner), colour TV, Sky basic package plus movies, DVD and CD player, access to broadband, pine dining table and chairs. There is a bookshelf and a selection of books. Views from the lounge across the drive to the field and woodland. The Kitchen Area with fitted units includes electric cooker, fridge/freezer, microwave and washing machine. There is a rotary drying line in the garden. The Bedroom is attractively furnished in pine with double bed, bedside tables, wardrobe, chest of drawers and views to the woodland. En suite shower room with shower cubicle and electric shower, toilet and handbasin, shaver point and fan heater. Small patio to the front of the property with garden furniture. Parking adjacent to the property. 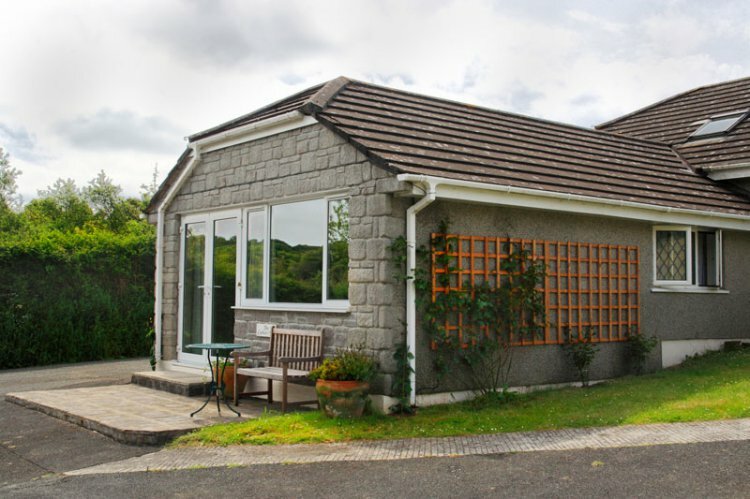 Rental includes heating, electricity, bedlinen, towels, Sky TV and broadband access. Access to tumble dryer if required. 'The Cuckoo's Nest' is a self-contained annexe adjoining property 272 'Forrester's Lodge'. Also available attached to the owners' property is 370 Pheasant's Retreat, an open-plan first floor lodge sleeping two. Do not miss the new addition of Woodpecker's Hideaway P536. You are requested not to smoke inside the property please. The Cuckoo&apos;s Nest is part of the Treverry Woods family of cottages, the other cottages are displayed below.